* Cwmwd Ial re-enactors at last year's fete. The new date is Saturday June 9 rather than the traditional first Saturday in June. This is to avoid a clash with the Llangollen Round Challenge on Saturday June 2 as many of the volunteers are involved in both events. The fete will have all the usual attractions, stalls, refreshments and activities for the children. year’s performance will be even bigger and more spectacular than last year. 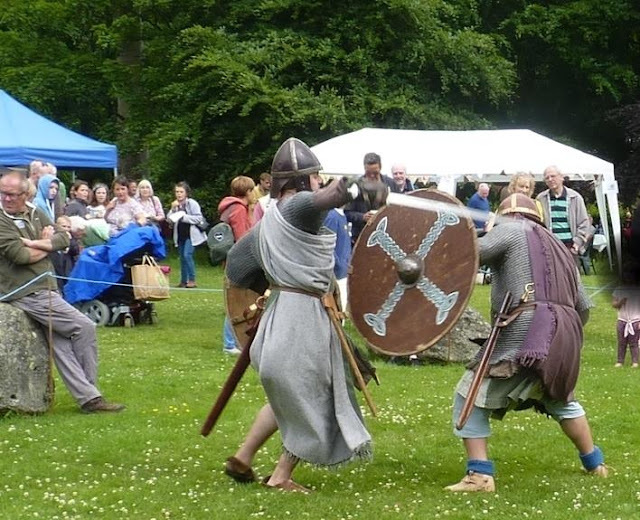 Cwmwd Iâl re-enact living history and combat displays at events nationwide. They portray the people living in Wales between the 9th and 12th centuries. Fete organisers are delighted that both Ysgol Bryn Collen and Ysgol Y Gwernant will be involved and the Brownies and Rainbows will also have their own competitions. More details of the event will be available later.